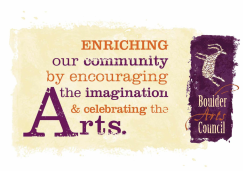 Once your calendar has been made, you need to share it with B Art C.
We ask to make sure that all included events are for the community and not personal calendar events. If you are interested in sharing a single event, please email all needed details to a board member. Help, I need to create a calendar to share! Use an already existing google account or create a google account. If you need to create an account, type “google.com/calendar” in the address bar. Top right of screen you will click on the red “sign up” bottom. Open google calendar -- either click on “calendar” button on the top of page or type “google.com/calendar” in the address bar. On the left side bar you will see “My calendars” and a small down arrow to the right, click on the arrow and select create new calendar. 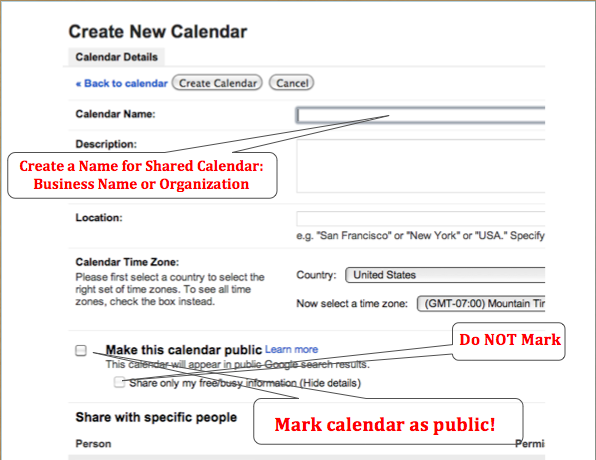 You must create a calendar name (either your business or organization), check “make this calendar public”, and share the calendar with boulderartscouncil@gmail.com … all other fields are optional. You created a calendar that will appear on the BArtC community calendar! Each time you add an event on your calendar that is shared with BArtC it will automatically sync and appear on the website. 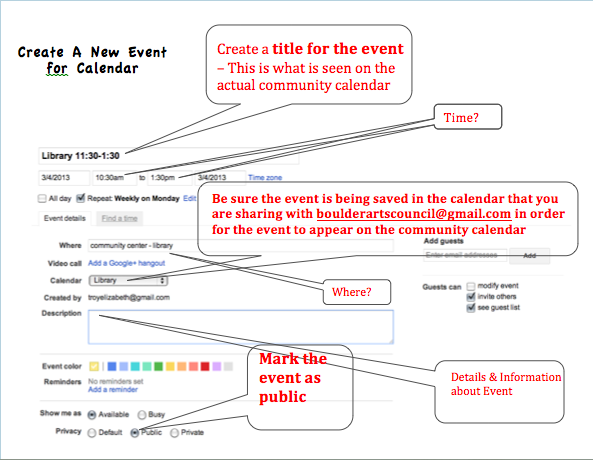 You Created an event that will appear on the BArtC community calendar!